Mulgrew wishes us a happy new year, points out we are back to work. Says he will be at Friedrichs hearing with retirees. Discusses Regents decision, says it’s temporary but will be made permanent in February. Says we will now have to renegotiate evaluation. Says there are many myths out there. Says SED has action plan that requires NYS to change or adopt NY standards. Says there must be separate standards for special ed. and ESL students. Says we should have large voice in that since most of them are in our district. Says he wants to form a task force to address this. Family leave—announced by mayor for non-unionized employees. Says every UFT President has looked at issue but this is first admin that may entertain it. Says other admins suggested women have babies in summer. 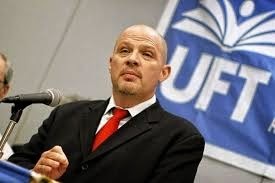 UFT is negotiating with city. Says any decision will be brought back to “you guys” in Delegate Assembly. Says we will not overpay dramatically, but at negotiating table there is a price for everything. Says leadership is very creative in how they do work. ICT survey—says chancellor was shocked at survey response, had thought every school had done this appropriately and all teachers had common planning time. Says it’s unacceptable to pull teachers from ICT classes to sub or not to cover ICT teachers when absent. Suggest money is wasted on APs in smaller schools. Metal detectors—UFT doesn’t believe in zero tolerance. Says other extreme is that no one can be suspended, or that insubordination is not suspendible offense. Suggests good school culture is obvious. Says he’s seen some great schools in most challenging areas. Says UFT stresses respectful environment between staff and students. Says some schools fail to report acts and make suspensions look ridiculous. Clearly some students impeded the educational process of other students. We need to establish process to deal with said impeders. Mulgrew does safety and discipline survey, has CLs fill out on spot. Does school have safety committee? Does school have a de-escalation plan? Has DOE provided training and info on plan? Does school have sufficient staff for intervention services for students who act out? Does your school have a functioning ladder of referral that teachers know how to use? Is there a location within your school where disruptive students can be safely isolated from others? Have students in your school lost valuable learning time as a result of other disruptive students? Priority is we all have more to do on education, particularly funding and CFE. Says union forewent raises to get class size within contract and that city should now fund it. Says no one in state is adhering to class size reduction plan. Says that this session we will push heavily on anti-creaming language for charter schools. Brings up Moskowitz, says she uses safety as argument for tossing low-performing kids. Says non-level playing field is outrageous. Mulgrew speaks fondly of last year’s plan, says approval rating went down and that governor is now professing love for teachers. Says we’re in a much better place, is more to do, but we have a plan at all times. Says he doesn’t tell everyone what he’s doing in Albany, has a strategy, says this session is expected to be much better. Says it’s election time at UFT and to let shenanigans begin. Mentions late Passover and that Easter will be Good Friday only. Says we can only afford one snow day this year. Mentions this Friday spending deadline for Teacher’s Choice, and following deadline for form submission. Mentions Friedrichs case starts next Monday. Understands it’s a problem. Says they are claiming not to hate unions but only want to protect freedom of speech. Points out it’s not being paid for by teachers. Adam Ross, UFT counsel comes up to discuss. Ross—Most of 19th and 20th century law was anti-union. During height of Depression FDR passes national labor relations act, allowing workers to collectively bargain, but does not apply to public employees. It allows unions and employees to say everyone has to be member of union. Unions became very powerful, had strikes, passed Taft-Hartley Act. It outlaws rule that employer and union can mandate membership. Created agency shop—non union members have to pay for expense of collective bargaining but not political activity. Taft Hartley says they must be enforced unless state says otherwise, so-called right to work. Calls it bizarre and unusual provision, but there are now 25 RTW states. Public employees not covered. In 1967 NY State law, Taylor Law, guaranteed public employees right to bargain but outlawed string. Modeled after TH, and required pay for collective bargaining but not political activity. Abood called it unconstitutional, Heard by US Supreme Court which said since you were only supporting collective bargaining, said these arrangements were constitutional, 9-0 decision. All over state contracts are negotiated based on this precedent. Courts resolve conflicts over what is and is not political. Harris v. Quinn, Judge Alito had multi-page rant on how bad Abood decision was and invited someone to bring case to overturn it. People paid attention and very quickly right wing found people in CA to try to overturn it. Went in, asked for adverse ruling so they could go to Supreme Court. Took it to higher courts in CA, did the same. Gave Alito what he asked for, and at least 4 of 9 judges voted for it. Unusual for court to invite challenge to existing SCOTUS precedent. Plaintiffs claim it is violation of their 1st Amendment right to have union leaders speak to politicians. Unions claim they don’t pay for that, but rather for collective bargaining. Plaintiffs claim every single thing unions say to employer is political speech. Say they may oppose things unions negotiate. Ross calls it wrong, cites previous SCOTUS rejection. Says since we have to represent everybody, everyone gets benefits and must pay fair share. From legal perspective, there’s a state’s rights aspect. This circumvents NY State law, says states make decisions, e.g.. strikes, unions, collective bargaining. Says Justice Scalia may be swing vote. Says court has no info on what to do with agency fees. Says SCOTUS has no business deciding what’s constitutional until they know what we actually do with money. Says we are required by law to negotiate, that they are abridging this, and that this is clearly about weakening labor movement. Mulgrew—Says we know what they’re up to, what it’s really about, and that we’re the last people standing up to the rich. Says the rich feel they have the right to influence policy and law due to wealth, and that we ought not to have voice. Says it might be good thing because this is not “a God-given right.” Says no one has ever given us anything. We fight, we advocate, and then we usually pay on top of that for these things. Says it’s about union standing up to make things better. Mulgrew gives results of poll, most schools have not cooperated. CL—Some schools have inter-visitations during prep, and are paid. Can staff be forced to do this, and can colleagues be forced to accept visitors? Mulgrew—wouldn’t be appropriate to pay anyone unless it was duty-free period. If someone is being paid, they cannot be forced. Should entail consultation. Says some teachers can be paid for allowing visitors. Delegate—How are arts teachers expected to be fit into Danielson, which is detrimental to our rating? Mulgrew—we will discuss what eval looks like this year and next year. Says this will come up. UFT could argue observers must understand subject area. Says Danielson cannot be used if observer doesn’t understand subject area. CL—What is our pushback when principal abuses budget? Mulgrew—put budget in front of SLT and tell them how principal is using it. Says he did that. Says CL can go to superintendent. Delegate—In transfer HS, Regents results only counted for June students, wants January efforts recorded. Mulgrew—will make sure January results included also. Says we can do so in February. Repeatedly suggests remark is cryptic, and I don’t get it at all. Q—How do you handle principal who constantly says he’ll go to legal, but always comes back with answer of no? Mulgrew says no principal should say he has to talk to legal, and DOE agrees. Says to refer matters to DR, who will then report to superintendent. CL—Paras are asked to do lunch duty. What is our stance? Mulgrew—paras get duty free lunch, but may be assigned one on one. Still get duty free lunch, not eating with student. CL—Stories about school segregation—how are we handling this? Mulgrew—We support diversity. Happy that it was teachers from PROSE schools who made plans to integrate schools via admissions process. Q—Chancellor’s receivership—what is it? Mulgrew—renewal plan set by mayor, UFT working on it. Says state, not chancellor will set benchmarks. Says closure does not fix struggling schools. Dave Pecoraro—Moves that UFT support PSC in trying to get new contract. Next month. Passes. Tom Brown Asst treasurer—supports res. against terrorist atrocities. Asks we support victims. Seconded. Delegate—makes amendment—to add many of our students are terror victims here and abroad, that we should recognize hate crimes as terror, and also to strike language such acts are “more commonplace every day.” Says it is dubious and weakens amendment. Dave P. speaks against amendment. Point of information—Asks for additional amendment—Mulgrew says it’s point of order. Asks to cut several whereas statements. Says domestic terror more of a danger here than foreign. Leroy Barr speaks against second amendment. Says resolution does not identify only foreign terror. Points to World Trade Center. Also speaks against first amendment. Mel Aronson—Resolution on out of control drug prices—says there is a prescription of $1800 per bottle of motrin and pepcid, OTC medicines. Welfare fund had to stop paying for that. Says some meds cost over 100K per annum. Says we need to allow Medicare to negotiate. Speaker supports, speaks of dire necessity of people to afford medicine. Dave P. calls question. Resolution passes.